The ultimate guide to Obertauern ski holidays. Obertauern stands apart from other Austrian resorts in more ways than one; it’s the nation’s only purpose-built resort offering ski in/ski out convenience whilst impressively maintaining Austrian charm. It has unusually high altitudes for Austria, with pistes peaking at 2313m, and the ski area is built in a one-of-a-kind circuit where you always return to your starting point, whichever direction you ski. This is one of Austria’s little known gems. Justifiably gaining in popularity with Brits, it was made famous by the Beatles who filmed their second feature film Help! here in 1965. Situated in the Salzburgerland region of the Austrian Alps and nestled within the scenic peaks of the Tauern mountain range, Obertauern was originally just a mountain pass before it became Austria’s first and only purpose built resort. Unlike most of the purpose built resorts you’ll find in the Alps, Obertauern’s chalet-style architecture gives it a good degree of alpine charm. 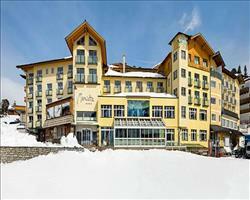 Also making it stand out as an Austrian resort is the fact that most of the accommodation is ski-in / ski-out. Another of the resort’s great advantages is its location only 90 minutes from Salzburg airport and 20km from Radstadt train station, which makes it the perfect option for those who want to avoid the hassle of long transfers and spend more time on the slopes. With an excellent snow record, a long season (usually from November till May) and a terrific variety of terrain, those who love friendly Austrian charm and lively après with quality snow to boot will find that Obertauern ticks all the boxes. Skiing here has been well designed; the ski pass allows access to a modern interconnecting lift system where you can ski 100km of pistes in a natural circuit without the need of ski buses! This clever system allows you to always return to your original starting point, whichever direction you start off in. The slopes are also generally quiet especially outside peak weeks, perfect for beginners and families not wanting to waste valuable ski time in long lift queues. Obertauern is a very family friendly which usually offers free lift passes for children up to 6 years old and those undertaking ski lessons. View our detailed Obertauern snow forecast or snow report and see all live webcams, piste maps, road and travel maps and lift pass prices. For a picture of historic snow conditions see the snow depths month by month with our Obertauern snow history. With the lifts in a central location, Obertauern’s skiing starts right in the town centre with many of the accommodation options ski-in, ski-out. With varied terrain, this resort is terrific for mixed ability groups. 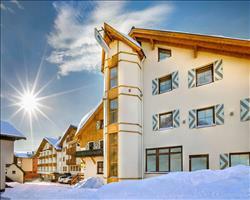 The nursery slopes and the ski school meeting points are conveniently situated directly beside the village. The ‘green circuit’ with 7 lifts including the main Zehnerkar cable-car gives access to superb open slopes where skiers can build confidence and progress. We like the Edelweiss run, a gentle wide green that leads through the trees. Intermediates are spoilt for choice with 36km of runs to explore. Worth checking out is the long red 16a from the top of the Zentrabahn lift - you can really get some speed up here. Advanced skiers should head to the notorious Gamsleiten No.2. Famed for being one the steepest mogul runs in Europe, this piste is not for the faint hearted and is sure to give any skier or snowboarder an adrenaline kick. Those with a competitive streak will enjoy the public race course where your downhill slalom time is measured (you’ll find it at the Schoenalm lift and the Schrotteralm lift). When snow conditions are good there is some excellent off- piste to be found – hire a local guide for a safe introduction to the powder from someone who knows the area inside out. For budding free-stylers, The Spot Snowpark is the place to be, with two sections and wide choice of rails, boxes and kickers. Cross country skiers won’t be bored here with 20km of trails running through glorious snow covered countryside, suitable for all levels and expertly groomed for both classic and skating techniques. Something everyone’s bound to enjoy is night skiing, usually taking place twice a week with floodlights illuminating a 1500m stretch at the Edelweissbahn lift. The après here is fun but not riotous and mainly based in the mountain huts dotted around and at the bottom of the slopes. You’ll find a mixture of traditional Austrian music and dancing and some good old Europop thrown in for good measure. A popular place is the Edelweissalm where things heat up from 3.30pm with live DJ’s, be prepared for some dancing on tables in your ski boots! Head to the Polar bear bar for cosy sessions by the open fire. 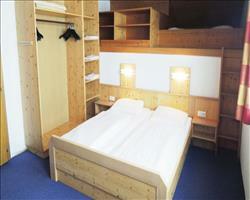 The majority of accommodation is half board and most hotels serve traditional Austrian cuisine to a very high standard. It is possible to walk into a lot of the hotels to dine in their restaurants. Should you wish to eat out, there are some lovely restaurants ranging from Italian pizzerias such as Da Giorgios’s to those serving regional dishes. Make sure you sample the menu at the award winning Almstube – their apple strudel is amazing. For a unique dining experience check out Hotel Marietta who have a “live cooking bar” where your chosen dishes are created in front of you. If you want to dine on the mountain try Lurzer alm for traditional Austrian specialities such as wiener schnitzel (deep fried breaded veal). Obertauern has a great range of non-skiing activities to keep you entertained including bowling and curling. 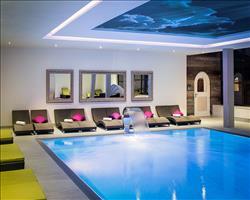 If the weather isn’t great you can always escape a white out and enjoy some well-earned pampering at many of the hotels who offer excellent wellness facilities. For something different, take a romantic horse-drawn sleigh ride through the beautiful forest landscape or book into an ice climbing course. A tranquil way to soak up the stunning mountainous scenery is snow-shoeing. Take a guided hike alongside frozen streams, powder snowfields and beautiful woodlands. Children will love the 1.5km tobogganing run which is usually floodlit every evening. When is the best time to ski Obertauern? Situated at a relatively high altitude of 1740m compared with the vast majority of Austrian resorts, the season runs from November until May with peak snow conditions likely to be around January-March. Obertauern has a snow-sure reputation however if snowfall is ever lacking the resort has excellent artificial snow technology with 280 Snow canons covering 95% of the slopes. The Ski Club of Austria hosts the annual Winterfest usually held in February, this party is packed with action including a spectacular ski demonstration from pro skiers, great stunts, a snow bar and fireworks display – check out when it’s on this season if this sounds like your cup of Jägertee. Obertauern has an infectiously friendly laid-back atmosphere and with generally quieter slopes than the big name resorts and a short transfer of only 90 minutes, it’s no surprise that this is a popular destination for family ski holidays. Make your family holiday simple by choosing a property near the ski school meeting place and lifts so all the family can easily reach the slopes. We love Hotel Marietta which has doorstep skiing with the Zentralbahn chairlift less than a minute away and the Alpenhotel Tauernkönig which is only 150m from the nursery slope. Give our ski specialists a call if you are interested in properties with childcare on-site for any little ones not yet on the slopes. The ski area is great for parents bringing their children on their first or second ski holiday with friendly and highly rated local ski schools including Ski Club Austria whose motto for little ones is “learning through play”. With gentle nursery slopes and accessible blue and red slopes to progress on to your children will get up to speed in no time. The well designed system of 26 lifts allows you to ski in a circuit clockwise and anti-clockwise and always return to your starting point all without a ski bus! Families can ski the “green circuit” which consists of 7 connecting lifts where you’ll find wonderful open slopes, perfect for beginners to practise their technique outside of ski lessons. Groups looking to escape the hustle and bustle will love Obertauern. With snow-sure conditions and 100km of pistes to explore with varied terrain it is a great destination for mixed ability groups. Beginners are spoilt for choice with gentle nursery slopes right beside the village and there are easily accessible green and blue runs further up the mountain. There will be no chance for intermediate skiers to be bored with 36km of reds to master and experts can hire a local guide to discover the legendary powder. The good thing about the area is that mixed abilities can start off and end up at the same place thanks to the circuit nature of the pistes. Groups love our hotels with their own bar and lounge area, you can meet in the bar and lounge area for an aperitif before dinner and have a natter about the day’s events. 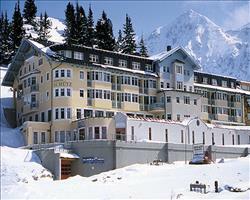 Hotel Steiner is a lovely property located only 150m from the resort centre. Whilst this is no St Anton, Obertauern won’t disappoint those looking to unwind and have a boogie. The Polar Bear Bar is great for relaxing with lovely atmosphere. Order a white wine spritzer, a popular drink in this region and thought to be invented in Austria and if you want to dance the night away, the Tavern has a lively disco to enjoy until the early hours. If your group are all planning to fly out to the resort, select one of our packages including flights and transfers for the ultimate fuss- free break. If road trips are more your style ask us about our self-drive packages with channel crossings included - make sure you have your Beatles album handy as their 1965 film Help! features scenes shot in Obertauern. If your group are organising travel separately ask us about our accommodation only deals. It’s great for family skiing. It’s a bit quiet but it’s a nice resort. We had a good time here.